A flaw in the plan…. My original plan was the mount ten high intensity LEDs underneath the transformers. By lighting the ring from these hidden sources I thought I could hide the actual lights and cause the ring to appear to glow on it’s own. However, I cornered my self when I began to plan how to wrap the transformers with magnet wire. I found that I couldn’t wrap the transformers until after the LEDs were mounted, but I could mount the LEDs and run the wiring until after the transformers were wound. 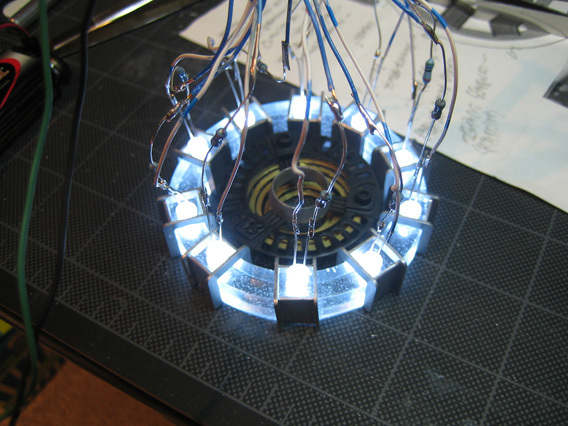 I decided to redesign my lighting by placing the LEDs into a “chandelier” configuration underneath the repulsor emitter. This actually gave me a brighter light than my original plan. 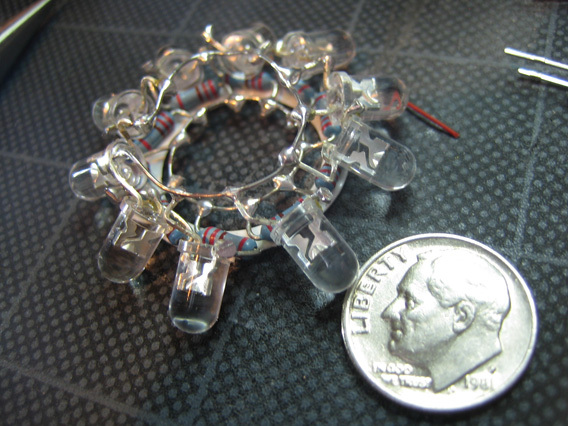 Here’s a test lighting arrangement with LEDs and their current-limiting resistors…. Lighting also revealed my old enemy, the bubbles again. GAK! I hate those things!